A small eco-friendly campsite, just 5 pitches and a Mongolian glamping yurt on 3 level fields sheltered by willows. Each pitch has its own picnic table and fire-pit. Facilities: hot shower and washing-up, fridge-freezer, hairdryer and washing machine. 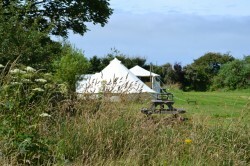 We’re a Greener Camping Club Site just 3 miles from both Solva and St Davids. Online booking.